Firstly my apologies. This review is extremely late and I could make up some wonderful alien-abduction type excuse, but the truth is I just didn't get time to watch the episode on preview or during transmission and have to watch each show twice to gather my thoughts into barely cohesive sentences. But, thems the apples, and so without further delay here is my thoughts on The Immutable Truth. I have enjoyed the consistency and patience shown by the writers of Bates Motel this year, alongside Vera Farmiga's stunning portrayal of Norma, it has been a highlight, but after last weeks episode I was itching to see more of Norman's descent into madness. And we saw exactly that, except in a subtle, controlled and measured way rather than a blood bath at the end of Norman's knife. What we got was a glimpse into Norman's psyche, his way of not taking responsibility for his actions, his transformation into his mother. 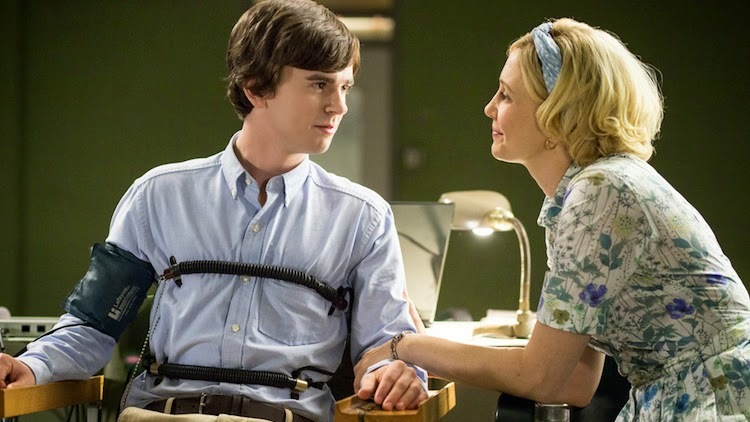 During the polygraph test, which Norman passed so now Sherriff Romero will back off him, we saw Norma tell her son that she killed Blair to protect him, except it wasn't Norma it was Norman's vision, his built in internal excuse. Elsewhere the drug story, that has been the low point of the season so far, was finalised, Dylan was welcomed back into the bosom of the Bates family by an emotional Norma, and Romero now has nothing to investigate. Whilst this tenth and final episode of this run wasn't explosive, it did set up the next season perfectly. The Norman/Norma killing machine can now unleash his twisted mind on unsuspecting guests, and we can get a step closer to seeing Freddie Highmore morph into Antony Perkins.